Coming to New South Wales in 1839 at the age of 24 as a penniless assisted migrant, Henry Parkes brought with him an urge towards self-betterment and a democratic temperament, both characteristic traits of the skilled workmen of the Birmingham in which he had grown up. In the infant colony he soon revealed speaking and writing skills remarkable for a man lacking formal education or privilege. After taking a leading part in the democratisation of the constitution, which in 1856 established local self-rule, he went on to spend a half-century of almost unbroken membership of the colony’s parliament, serving five times as Prime Minister, and becoming recognised by the late 1880s, on all sides, as the ‘Grand Old Man’ of Australian politics. Parkes’ achievement was to fashion a political career over many years during which members of parliament were not paid a salary, and through which he himself in consequence suffered great financial vicissitudes. But his skill as a parliamentary leader commanded support and his integrity was unquestioned. In his hey-day formal political parties, based on declared policy, did not exist. In a milieu in which principle was at a discount, his name was associated with a wide range of social reforms, and he presided over the major achievement of his era in the colony: the establishment of an effective system of public education. It was fitting that, near to the end of his career, he was able to make a crucial contribution in the march towards the federation of the Australian colonies. 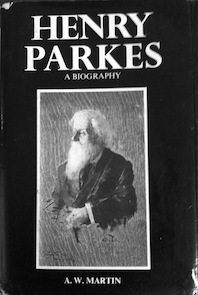 Essentially, Parkes’ life was the life of politics. In the political enterprise he found self-realisation and, despite the many setbacks, disappointments and compromises of his personal life, he held firmly to belief in the central importance of what could be achieved through the parliamentary institutions of his adopted society. That, essentially, is why his name can be confidently given to a Foundation for the most serious study of Australian political history. Henry Parkes dominated political life in New South Wales during the second half of the nineteenth century in the way that was true of William Charles Wentworth during the first half of the century . As a leading representative of urban-based, mostly middle class Sydney interests, however, Parkes opposed the aspirations of the squattocracy to which Wentworth belonged. He cut his political teeth in the 1840s and early 1850s when he came out in opposition to the squatters who sought to consolidate their power base and who, with a view to obtaining cheap labour, supported moves by the British government to resume convict transportation to New South Wales. Parkes was one of those who joined the lively and well-attended demonstrations held at Sydney Cove in 1849 when the ship Hashemy arrived bearing convicts. Later, after becoming a member of the Legislative Council in 1854, he worked to democratise the constitution and throw the vast leaseholds of the squatters open to all colonists. By thus acting he gave a clear indication of the kind of society he sought to establish. Parkes was in fact a man of the people. Born in the year of the Battle of Waterloo, he was the seventh son of a Warwickshire tenant farmer who later became a gardener and odd jobs man in Birmingham. The family could afford to give Henry only a limited schooling and he was forced at an early age to earn his living in varying forms of manual labour. An enterprising man, however, he soon set up in business and when that failed looked to Australia for fresh opportunities. After reaching Sydney in July 1839 with Clarinda, the first of his three wives, and their two-days-old child, he tried his hand at a number of occupations before opening a business in Hunter Street as an ivory turner and importer of fancy goods. Business, however, was never his strong point and throughout his life he suffered recurrent setbacks which, from time to time, left him in financial difficulties. Were he to be judged by his capacity to make money he would have been considered a failure. That New South Wales became a land of opportunity reflected not of his capacity to succeed in business but his abilities in the political arena. This was a sphere that had aroused Parkes’ interest while he lived in Birmingham – a city which was the scene of considerable political and social unrest. Parkes joined the radical Birmingham Political Union and became a political activist. After reaching Sydney he soon found himself in company with the many radical migrants who left Britain during and after the 1830s. He quickly rose to the fore, in 1850 establishing the Empire newspaper which became a vehicle for the expression of his beliefs. Parkes commanded widespread attention with his imposing figure, flowing beard and great eloquence, marred some thought by the timbre of his voice and a tendency to drop and misplace aitches – a practice he shared with many of his fellows. A contemporary Bulletin cartoon depicted the cleaner at Parliament House sweeping a large pile of dropped aitches from the Legislative Assembly chamber. The Parkes era predated the formation of party politics and was marked by the existence of a number of factions which constantly jockeyed for power. Forming a government required powers of persuasion and leadership which Parkes possessed in abundance. He headed five ministries and was a major force in colonial affairs for half a century , establishing a reputation as one of the most astute nineteenth century political leaders in Australia. Dr Allan Martin, who pioneered the study of New South Wales politics in the second half of the nineteenth century and who wrote the definitive biography of Parkes, justly described him as a man of integrity who firmly believed in “the central importance of what could be achieved through the parliamentary institutions of his adopted society”. For this and for his strong espousal of democratic principles, he deserves the gratitude of later generations. Parkes also warrants recognition for placing elementary education on a firm basis in New South Wales. His 1880 Act laid the foundations for the modem primary school system and reflected his belief, common to nineteenth century liberals, that education offered the best means of allowing children to fulfil themselves and gain a full place in society. State schools also had the potential for bringing children of different creeds and classes together, thus healing the sectarian rifts that were so strong in his day. These were noble ideals but they ran counter to the equally sincere and strongly held beliefs of those, particularly in the Roman Catholic church, for whom religion was central to education. Parkes’ Education Act proved divisive but it did nevertheless open doors of opportunity for many who might otherwise have found them closed. In this, the year of the centenary of federation, it is only fitting to remind ourselves of the part which Parkes played in bringing federation about. His 1889 Tenterfield Address, which reflected his awareness of the growth of Australian nationalism, played a key role in setting the movement in motion and he carried it a stage further by organising a Premiers’ convention to draft a constitution. He died before seeing his dream fulfilled but the vision he displayed in this and other spheres show that he possessed statesmanlike qualities of a high order. His enthusiasms could sometimes carry him to extremes. Witness, for example, his attempt to change the name of New South Wales to Australia in 1887 and his proposal to build in Centennial Park a National Palace where the remains of leading public figures could lie in state. Ridiculed as the ‘Valhalla of New South Wales’ the palace was never built. Yet it is well to remember that Parkes showed great foresight in planning to set up a state archives and house it there. Earlier he had employed the aged educationist and historian, James Bonwick to transcribe historical records preserved in London and send them to Sydney. In this and in other ways he did much to promote an appreciation of Australian culture. His 1880 Act stipulated that all primary school children in state schools were to be taught Australian history. Parkes belonged to an epoch in which attachment to Britain and the British monarchy and empire was strong. It was also an era which had not yet learned to appreciate the contribution of women to Australian life, or the richness and importance of Aboriginal culture. Parkes displayed humanity in his attitude to the Aboriginal people and in 1889 he announced his support for female suffrage, although he did not favour giving women a seat in parliament.. He was in many ways a product of his age and accepted its values. He stood out, however, as a creative leader who, besides leaving an enduring mark on the life of his colony, possessed a vision that extended beyond its bounds. It is fitting that his name should be attached to a room in the State Parliament to whose life and traditions he made an enduring contribution. 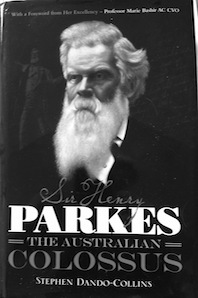 'Henry Parkes: A Biography', by historian Allan Martin, was published in 1980 and remains a definitive reference on Parkes, particularly his political life. It's out of print, but copies can be sourced online. 'Sir Henry Parkes: The Australian Colossus' is an engaging biography by Stephen Dando-Collins. Published in late 2013, it's available in good bookshops as well as through Random House online.